We design every one of our websites to be unique to our clients. All of these websites started out blank, we built everything you see from scratch. Below is just a small selection of websites that we have created. We have completed jobs for over 300 clients, ranging across many different businesses. 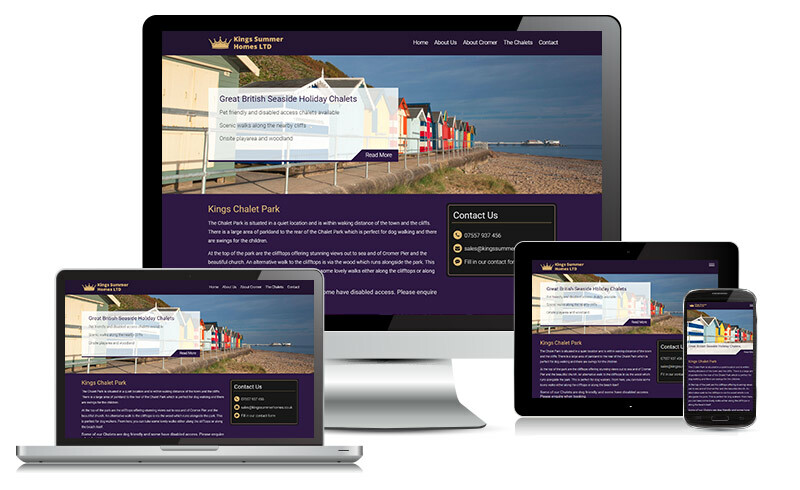 This website was built for a property development company in Norfolk. We started by developing a logo for the client, which we then brought the colours and font into the website to create synergy across the brand. We then copied the design across to the client's Facebook Page. Macbrook Gas specialise in supplying and fitting boilers across the UK. With this website we created a questionnaire that once filled in provides the user with a recommendation of what boiler they need and a quote for Macbrook gas to fit and install the new boiler. Badger & Brown are a company that produce and sell bespoke cufflinks. 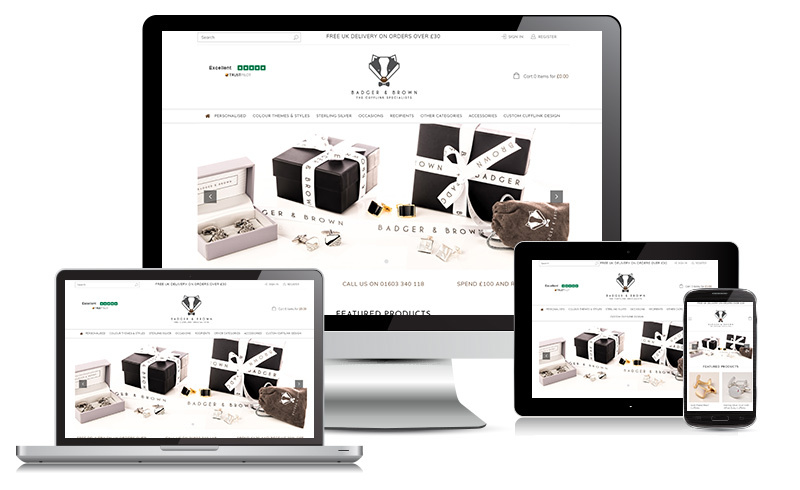 We built them an ecommerce website that gives the customer the ability to upload images, and add their own custom text to really personalise their cufflinks, whether for themself or as a gift. Norwich Bathrooms & Kitchens supply and install bespoke kitchens and bathrooms for customers over Norfolk. 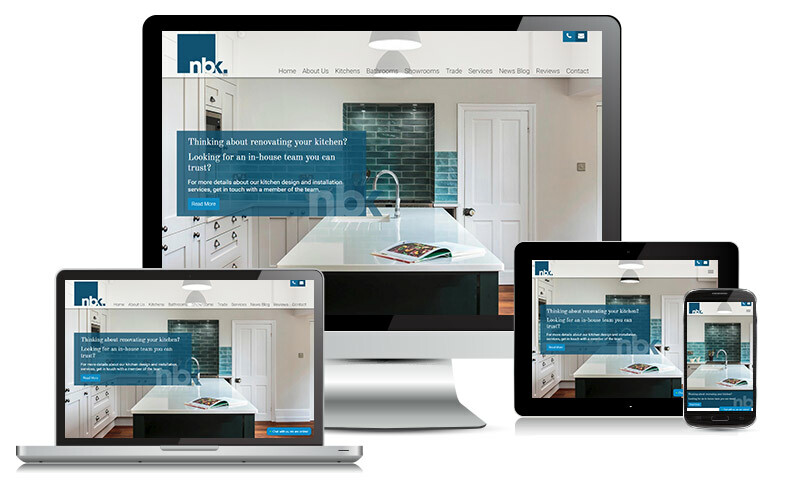 We built them a new website to make navigation easier for visitors and allows them to show off the range of beautiful bathrooms and kitchens they have installed. Designtec are proud to have supplied Norfolk Accident Rescue Service with their new website, talking about their history and allowing visitors to donate to the cause, join their lottery or sign up to first aid training courses. ADHD Care specialise in the assessment and treatment of ADHD in both adults and children. 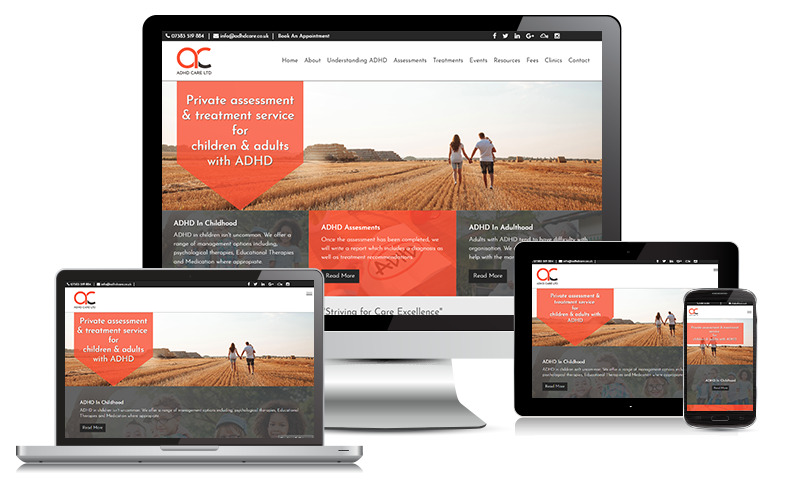 This website is designed to make navigation and booking as easy as possible while while at the same time providing the user with the information about the services ADHD Care offer. 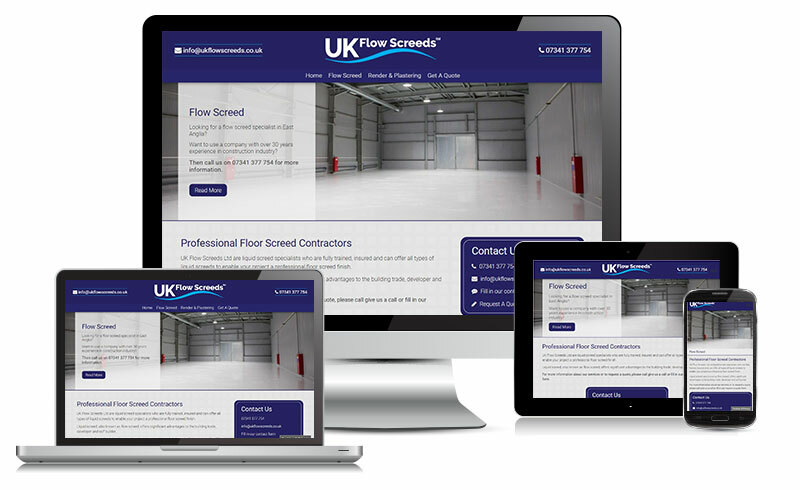 DANCO Flow Screeds Ltd are liquid screed specialists who are fully trained, insured and can offer all types of liquid screeds to enable your project a professional floor screed finish. Kevin Bell is a counselling and hypnotherapy specialist based in Norfolk. 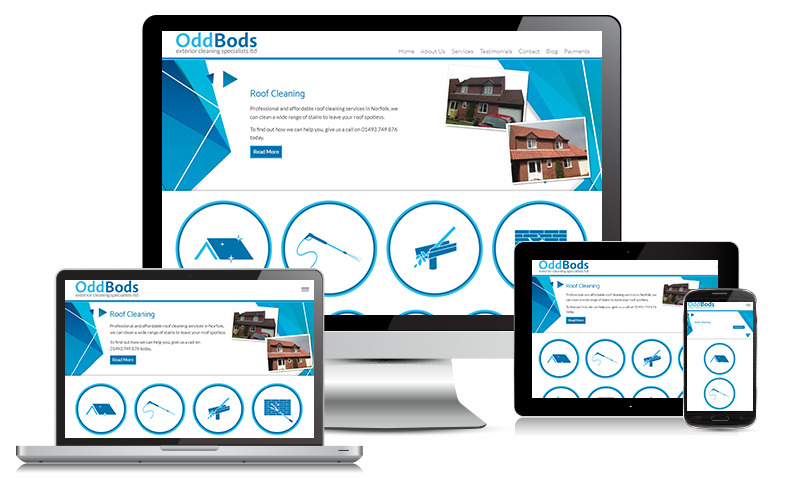 On this website we made sure that contact details were available on every page and that the colour scheme on the website matched their existing branding. "Neil and his team are great, from the initial enquiry to the finished product. They are able to communicate in both technical and layman terms. Before you spend your money anywhere else, speak to Neil first... you really are in great hands." 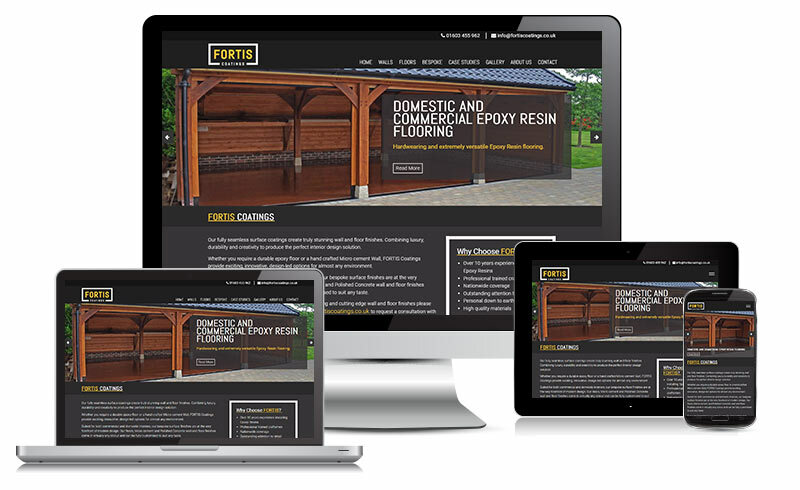 Fortis Coatings specialise in unique flooring across the East of England. As we were creating their logo, we were able to ensure that the website was an exact match with thier logo. A combination of high quality images and diferent shades of gray resulted in a proffesional looking website. DISCsimple provides a simple but comprehensive personality profile tool, allowing you to better understand how you interact with coworkers, staff and customers. We built them a website that allows them to promote this tool, using the colours associated with the 4 personality styles. DG Willis Accounting are a local accounting company based in Norwich. The client wanted a professional looking website that could inform potential clients of the services that they offer. We achieved this by using a simple design using the colours in thier logo. Magical Events Ltd provides tipi, tent and furnatire hire services to make your event magical. 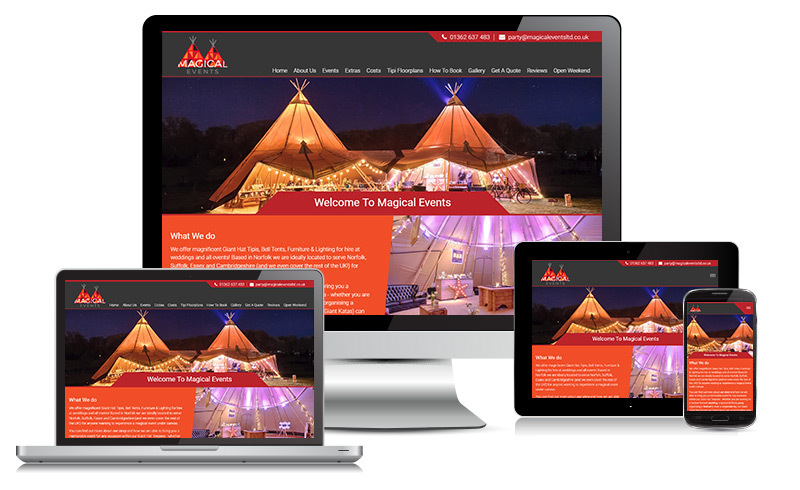 We designed them a new logo and website that showcases their range of tipis, and the fantastic interiors that can be achieved. 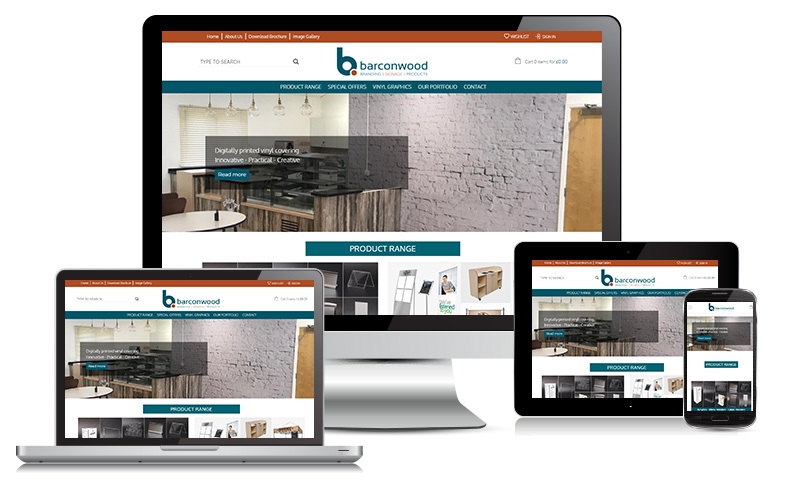 Barconwood provides a range of products and services, tailored to businesses in the catering and hospitality industry. We took over their existing ecommerce website, giving it a whole new design to make their website cleaner, and easier for customers to navigate. 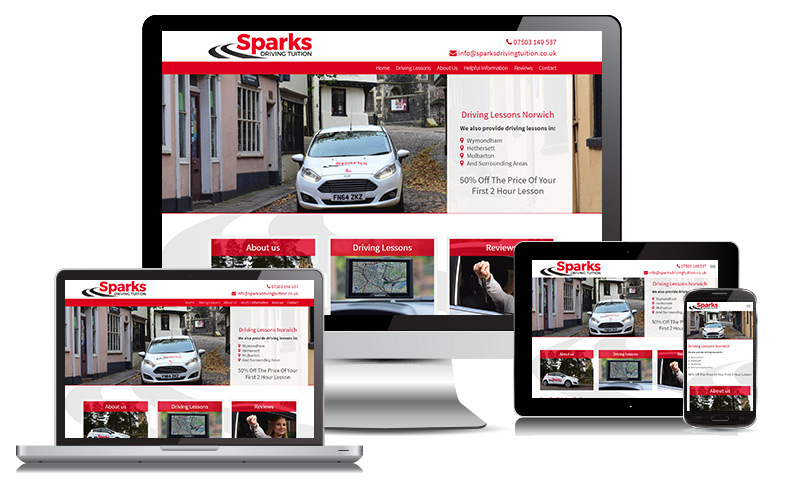 Sparks Driving Tuition are driving tuition company, based in Heathersett. To ensure key information such as offers were clear, we used large text and bold lettering. We also wanted to tie the website in with the companies branding, so we used shades of red and grey. 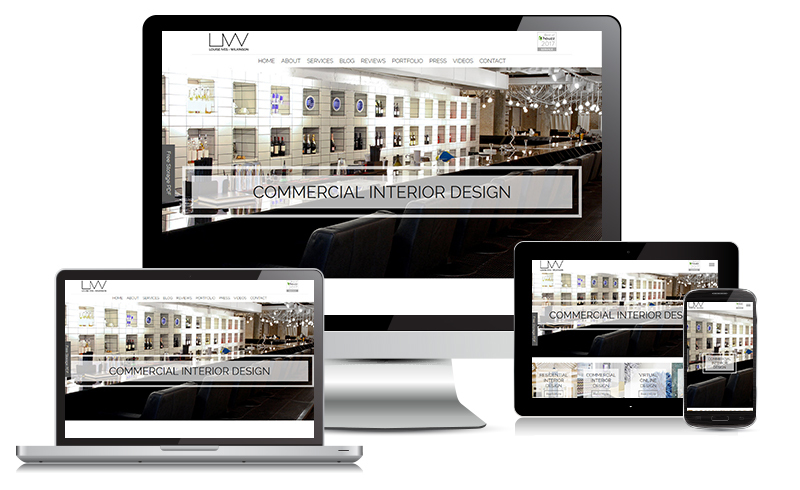 This website was built for a Norwich based interior design company. To match their existing branding, the design uses shades of grey to give the website a clean, modern look, with large imagery, showcasing their work. Kings Summer Homes are a chalet park based in Cromer. It was important that we made it as easy as possible for a customer to book a chalet. We did this by integrating our eCommerce system, with an external piece of software. Breckland Dog Training provide fun and informative training for dog owners across Norfolk. 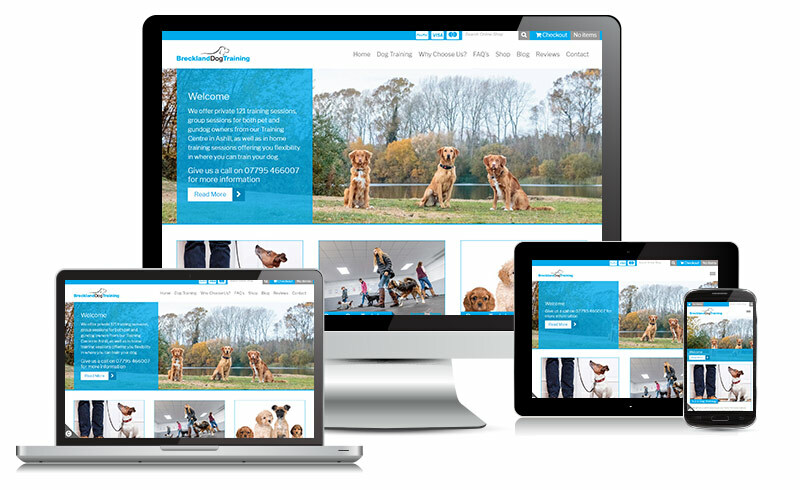 An important aspect of the business is the range of training options they have available, and making it easy for visitors to find the type of training that they need, while keeping the website attractive and functional across all devices. This website was built for Homefresh Services, professional cleaners for both domestic and commercial clients. This site has been split into commercial and domestic, allowing visitors to easily find what they need. This website was built for East Anglian Data Recovery, experts in finding and recovering lost files from failed hard drives. There were many important aspects of this build, including the Shipping form that creates a printable page to be sent with your device, as well as clearly displaying the customers USPs. 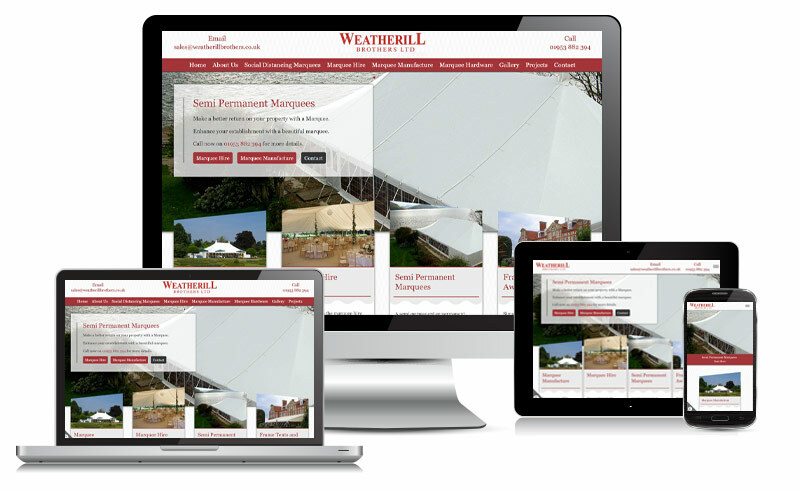 We created this website for a marquee manufacturing company, that has been a big name in the industry for decades. In the creation of this website we used the colour from their logo to accent the website. We also slanted the tops of the four boxes on the home page to replicate the look of a marquee. 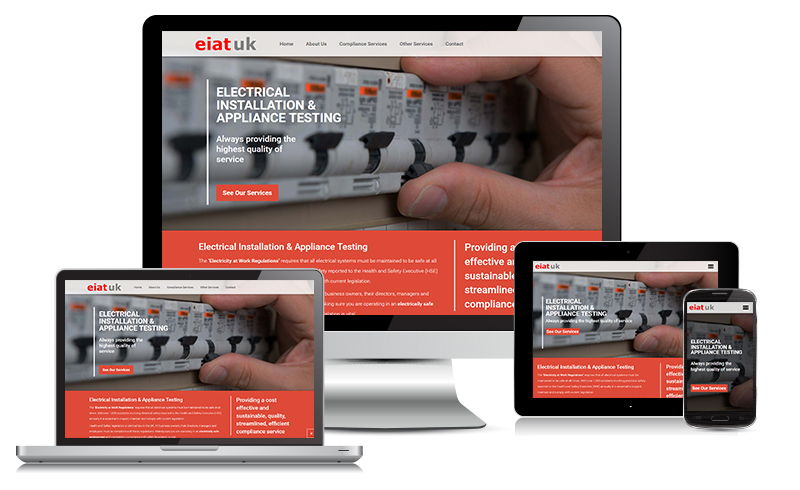 EIAT provide electrical testing and work with businesses of all sizes. 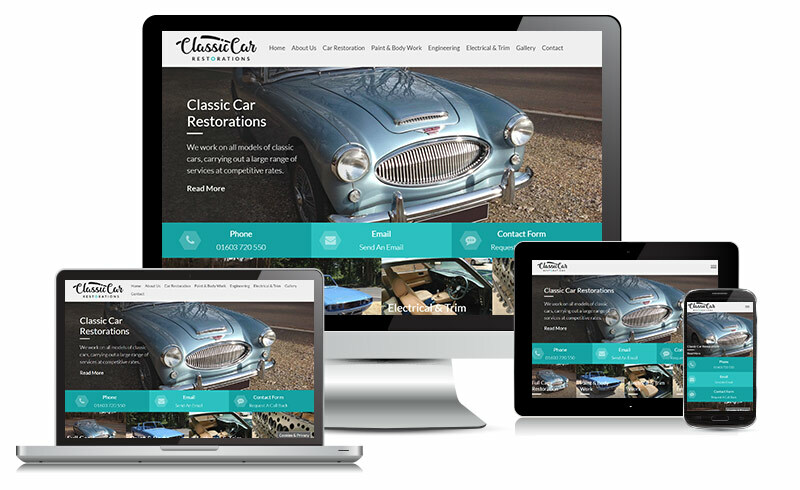 From the start of this project we were focused on transforming this customer's web presence to one that they could be truly proud of. Using bold imagery and strong colours to create a clean, professional website. TGA Services (UK) Ltd are a Norwich based building company. We used their identifiable logo elements to create unique looking headings for pages and stuck with only using the colours found in the logo for the overall design. The navigation of this website is split in to 2 clear parts (commercial and domestic) for ease of use. This is a website we have built for ourselves in order to try out some new layouts and designs. This is a small website which can still be navigated around using the menu at the top of the page. Advanced Cladding Solutions Ltd provide specialist construction and roofing solutions for the Agricultural, Industrial, and Commercial sectors. Made By Gracie is a business run by a young up and coming florist in Norfolk. The client wanted the focal point of the website to be the images, of the floral arrangements she had created. We did this by using large images in the center of the website with the text being displayed around the edges of the images.